Fraser Island is unique, and one of the most fascinating places I have been. The island is made entirely of sand and is the largest sand island in the world. It is also one of only 3 sand islands in the world that supports rain-forest. There are no roads as such on the islands, just sand tracks, so it is only possible to travel around in a 4 x 4 vehicle. 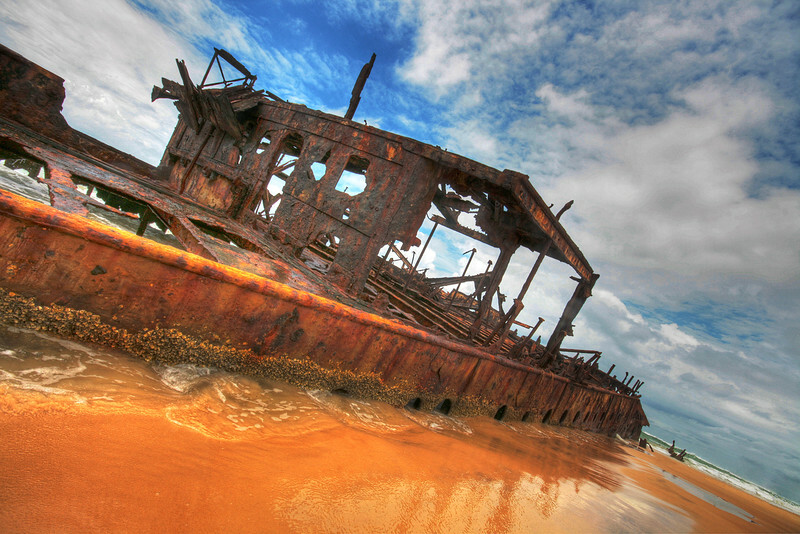 A major landmark of Fraser Island is the shipwreck of the S.S. Maheno. The S.S. Maheno was originally built in 1905 in Scotland as a luxury passenger ship for trans-Tasman crossings. During the First World War the ship served as a hospital ship in the English Channel, before returning to a luxury liner. In 1935, the ship was declared outdated and on June 25, 1935 the ship was being towed from Melbourne when it was caught in a strong cyclone. A few days later, on July 9, 1935 she drifted ashore and was beached on Fraser Island. During the Second World War the Maheno served as target bombing practice for the RAAF and was used as an explosives demolition target by special forces from the Fraser Commando School. The ship has since become severely rusted, with almost three and a half storey's buried under the sand.